Two editors of Zee News Sudhir Chaudhary and Samir Ahluwalia got arrested and were sent to two-day police custody, in the ‘Jindal Extortion Case’.Industrialist Naveen Jindal has alleged them of trying to extort money from him to suppress news against Jindal Group.Jindal Groups’ officials had done a sting operation on Zee News editors trying to negotiate a deal to suppress the news.Soon,Naveen Jindal released the video in public and filed a case against Zee News.This has ignited the debate over whether there is a need for regulation of the media. Paid news is becoming a shameful fact of journalism and news reporting and the Media is surely going through a Credibility Crises because after all even Media Houses are running their show for monetary benefits.Who can assure the Media Houses do not manipulate the truth ? In a country like ours where corruption has penetrated inside day-to-day life of commoners,can the Media be spared without scrutiny ? Sachin Tendulkar’s fluctuating future ? After a disastrous loss of Team India in the second test against England,Master-Blaster,Sachin Tendulkar, is under severe pressure.His performance with the bat has turned real bad and its been 6 innings since consecutively,where he could not perform at all! Speculations are being made that the BCCI selectors had a word with Sachin on his performance and while Sachin Tendulkar has left the decision on the selectors,they,on the other hand,showed confidence in him ! A decade back, the same name-Sachin Ramesh Tendulkar was termed ‘One Man Army’ of Team India,who helped Team India win many matches,single-handedly. 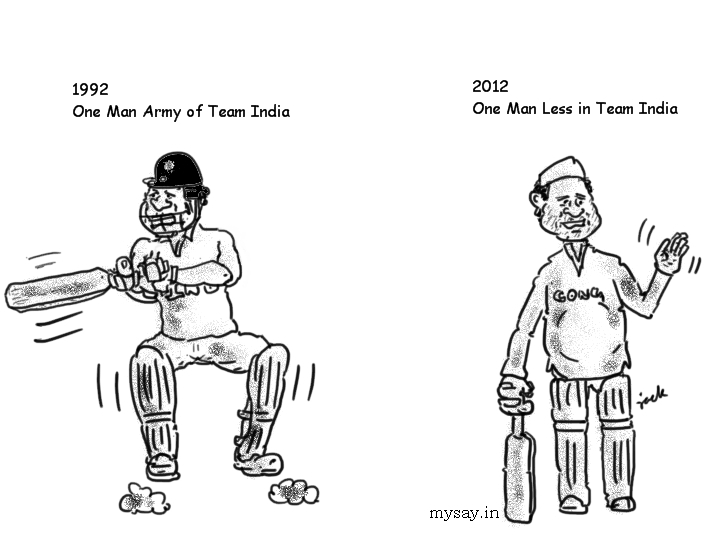 It is the same legendary cricketer whose presence in the team makes almost no difference. ‘Aam Aadmi Party’ the newly formed Indian poliical party by activist turned politician,Arvind Kejriwal,who would also be the convener of the ‘AAP’. Introducing,the Aam Aadmi Party at the Jantar Mantar,Delhi,amidst his supporters, Kejriwal confirmed his party would work to eradicate ‘Corruption’ in the country at all levels ! Regardless,’Aam Aadmi Party’ be successful in 2014 Elections,at least, the country has some hope intact. Congress has got enough chance since independence,BJP does not seem that promising and a Third-Front formed by several small parties has always been a disaster in the past. Sachin jokes that when his wife is angry,she is more fearsome to face than any enraged pacer, the cricket legend has played . Well,why not?An enraged pacer would not use anything beyond a ball to bowl at but a wife has almost everything to throw at that cannot be played with a cricket bat . MNS opposes Sena proposal of Balasaheb’s Memorial at Shivaji Park! Quite contrary to the expectation of MNS and Shiv Sena joining hands after Bal Thackeray, the Shiv Sena Chief expired, last week, the Raj Thackeray led, MNS, has opposed Balasaheb’s Memorial at the Shivaji Park and has instead proposed Indu Mill for the Memorial.This has brought both the parties into tussle mode again and assuring the world that Late Bal Thackeray’s efforts to unite his son, Uddhav Thackeray and nephew,Raj Thackeray, has failed ultimately.